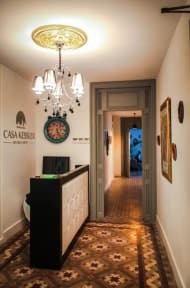 Hostel Casa Kessler i Barcelona, Spania: Bestill nå! 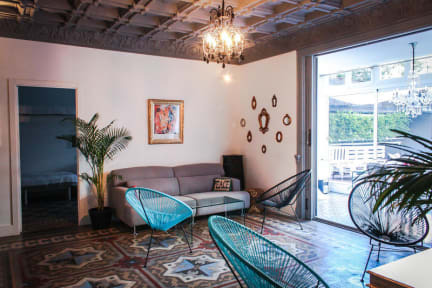 Exclusive Boutique Hostel with 7 rooms and 1 exclusive apartment. Hostel Casa Kessler is a newly opened hostel, located in a chic and charming Art Nouveau building. Its exclusive mezzanine has original floors and ceilings restored from the XIX century and perfectly integrated with modern interior. Hostel Casa Kessler is a newly opened hostel, located in a chic and charming Art Nouveau building. The rooms are elegant, comfortable and fully designed to make your stay unforgettable. Seven unique design rooms, cozy and warm, with a chill out terrace to relax and escape the stress of the city. Excellent location in the center of Barcelona next to Plaza Catalunya, Las Ramblas and Paseo de Gracia. Hostel Casa Kessler Barcelona has 3 exclusive double rooms, 4 shared bedrooms and 1 independent apartment. Each room is unique and special, with sophisticated interior design focused in details. The rooms are elegant, comfortable and fully designed to make your stay unforgettable. Our independent apartment is an excellent space for a special stay in the city, with two beautiful balconies, a dining room design and two beautiful bedrooms with incredible details. The kitchen and bathroom are very well designed and stand out for their warmth, elegance and practicality.